Wal-Mart operates about 4,000 stores in the United States and close to 3,000 stores in 13 countries outside of the United States. Why the world’s largest retailer has to partner with an Indian entity… Can’t it operate as a single entity in India? the answer is a big ‘NO’. Indian laws currently allow 100 % foreign direct investment (FDI) only in wholesale retail. Current foreign direct investment regulations do not permit global multi-brand retailers to enter India directly. At present, 51 per cent FDI is allowed but only for single-brand outlets. That said, Wal-Mart cannot enter the Indian market directly. This is because current regulations pertaining to foreign direct investment only allow “single-brand” retailers such as Nike or Gucci to own 51 percent of their business operations in India. So, Wal-Mart has to partner with some company and it chooses Bharti Group as its partner in India. 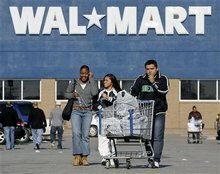 Finally, Bharti and Wal-Mart have announced a 50:50 joint venture for cash-and-carry and wholesale business called Bharti – Wal-Mart (P) Ltd.
Next post: Beijing Games 2008 Test China’s Rising Power !